I was getting a haircut a few months back and there was a September 2018 fine woodworking magazine in the waiting room. I thought the design was cool. Well, wify has a new desk. She still has not picked out the leather for the top. I changed the design because I do not have a lathe for spindle legs. I like mine more than the original. The width is 48 inches. Lots of room on the desk with a laptop. Also, the frame pieces are 1+3/4 walnut. The thinnest is 1” other than the dividers. The design has a hole for cords for a labtop. I put a surge suppressor with usb charging underneath as well. Almost done. She can’t decide on the leather color. I will repost when she decides. Beautiful desk and lucky wifey. I bet your wifey will want you to get more haircuts. Amazing! Its so cool to see this out of a magazine. Looks very nice!! Where are you getting the leather from? looking good steve but this is for finished projects not almost done.you should have done this as a blog.looking forward to seeing it done. nice work. Very nice. I also prefer the straight legs instead of turned ones. Looks a lot more graceful and in line with the rest of the design. You can buy Naugahyde from a variety of places – but here is one – https://www.fabricwholesaledirect.com/products/marine-vinyl-fabric?gclid=Cj0KCQjwj9LkBRDnARIsAGQ-hUenf4eR77dp3hTwmwyruKcIdbQZUp5Emitcbg8D8H6qBuGkwypE80kaAq2TEALw_wcB&variant=41720837196 It is great to mix media’s doing projects. 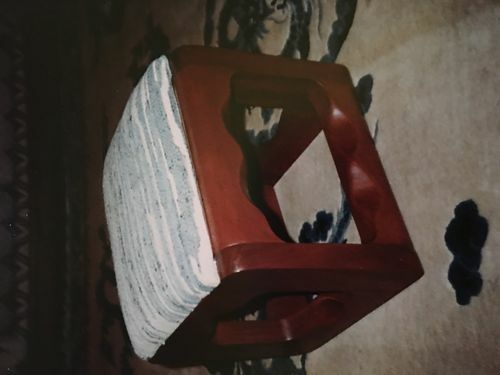 The pictured foot stool used to have material on the seat. But I have since redone it in Naugahyde. The desk is going to be so nice. Can’t wait to see it finished.